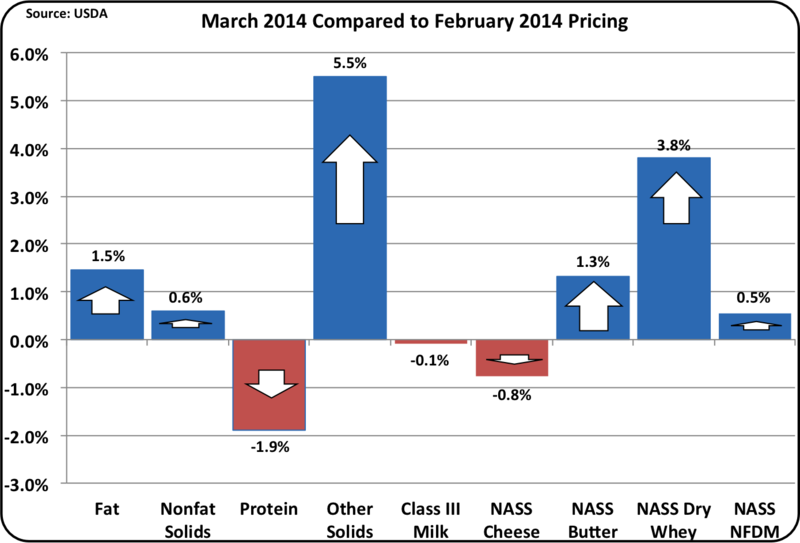 U.S. dairy exports remained robust in February 2014. The table below lists the February exports of those milk products that directly influence the Federal Milk Marketing Order milk prices. All of these products show increases over February 2013, however, exports of Nonfat Dry Milk/Skim Milk Powder (NDM/SMP) were not as strong as they were for most of 2013. Cheese exports remained at record levels in February. NDM/SMP is the largest export item for the U.S. and is the basis for Class IV pricing. 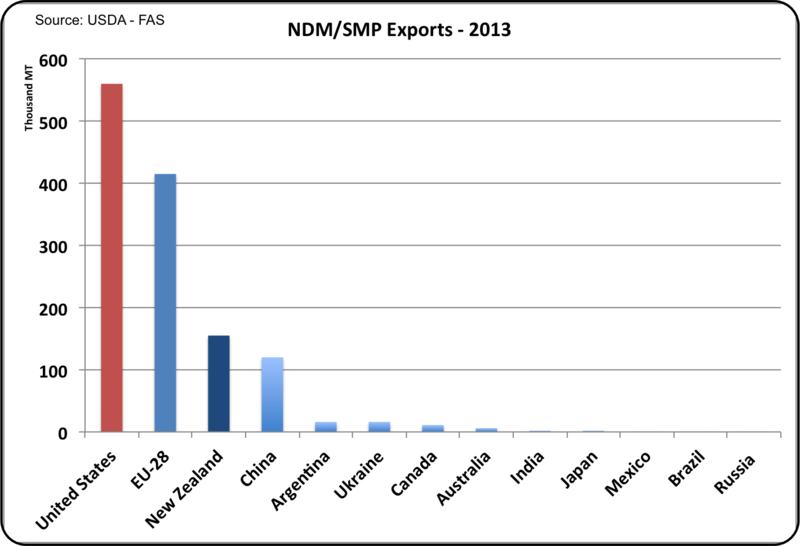 For 2013, the U.S. was the world's leading exporter of NDM/SMP. 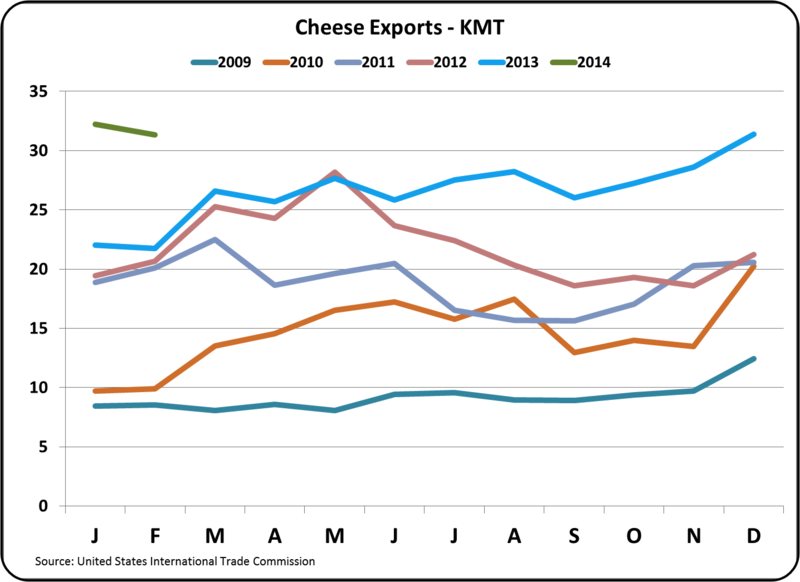 Cheese exports were especially strong; up 45% YTD. Cheese demand is especially important, as the resulting price is the most significant factor in Class III milk pricing which directly impacts over 50% of U.S. dairy producers. Cheese exports accounted for 8.1% of production, an all time high. These exports are putting pressure on cheese production. This has resulted in low inventories and high prices as reviewed in the prior post to this blog. The largest importer of U.S. Cheese is Mexico representing 22% of the export volume. Next is South Korea, which represents 15% followed by Japan with 12%. The most significant percentage increase over the prior year was the cheese exports to Saudi Arabia, representing 6% of U.S. exports. 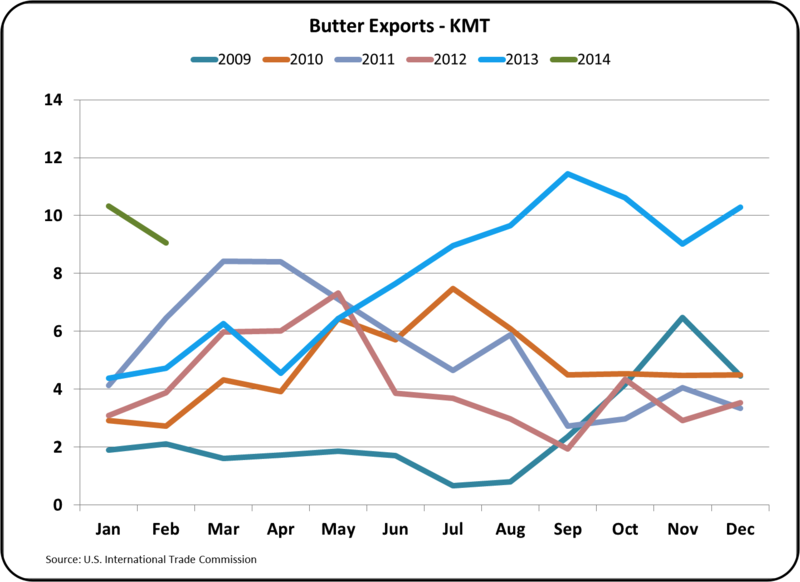 Butter exports have remained strong, doubling the prior year export levels. Although February exports were below January levels, they were still up 102% over February 2013. These exports represent 11.9% of butter production. 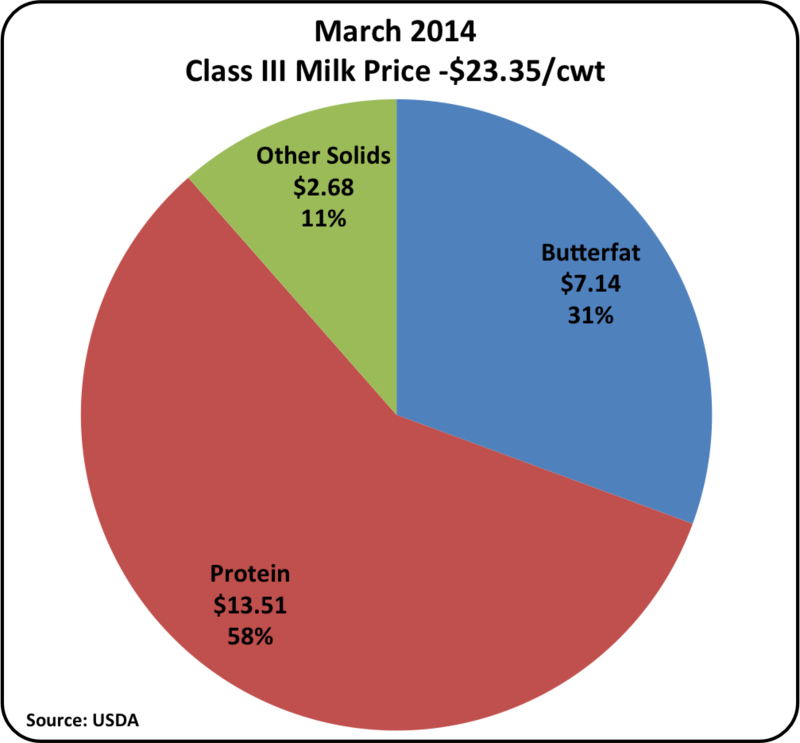 Butter (and butterfat) prices do not strongly influence Class III prices. However, from a producer's perspective, high butterfat prices do offer a good opportunity to increase revenue with increased butterfat production. The high export levels are keeping butter inventories low and butter prices high. Dry whey prices are the basis of other solids pricing for the Federal Milk Marketing Orders paid on components. Exports of dry whey remain strong with 65% of dry whey production being exported. The pricing of dry whey is obviously driven by exports. Dry whey prices have kept other solids near $.50/lb. for the last three years. This has allowed other solids to consistently contribute over $2/lb. to the Class III milk price. 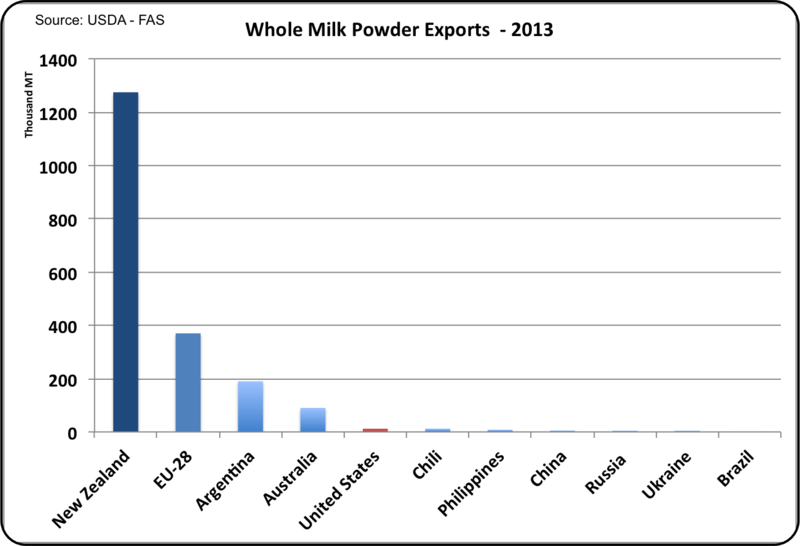 Whole Milk Powder (WMP) has never been a major production or export item for the U.S. There is no domestic market for WMP and the majority of the world's exports are imported by just one country, China. New Zealand has been the largest exporter of WMP by a significant margin. However, the U.S. is becoming active in this category with WMP exports up 236% over the prior year for the first two months of 2014. WMP exports of 10,008 metric tons are small compared to NDM/SMP exports of 74,930 metric tons. WMP pricing does not influence any of the Federal Milk Marketing Order formulas. However, this is a significant change in U.S. dairy exports and will continue to be followed in this blog. Exchange rates can significantly influence the competitiveness of U.S. dairy products in the International markets. The two major global exporters of dairy products are the EU and New Zealand. A weak USD has a positive influence on exports by making U.S. goods less expensive compared to international competitors. On the charts below, a higher value indicates a weaker USD. 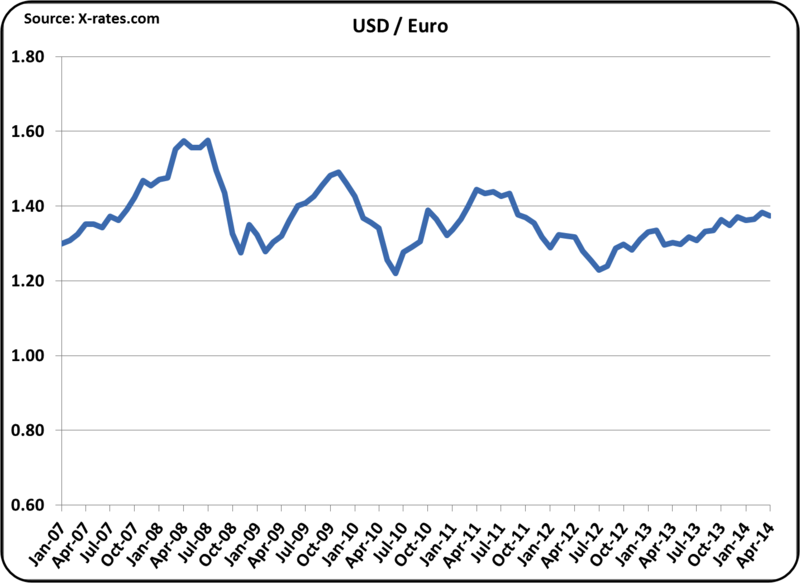 The Euro has been gaining strength and is at a three year high vs. the USD. It currently takes around 1.38 USD to buy one Euro. This provides a slightly favorable influence on U.S. dairy exports vs. the dairy exports from the EU. 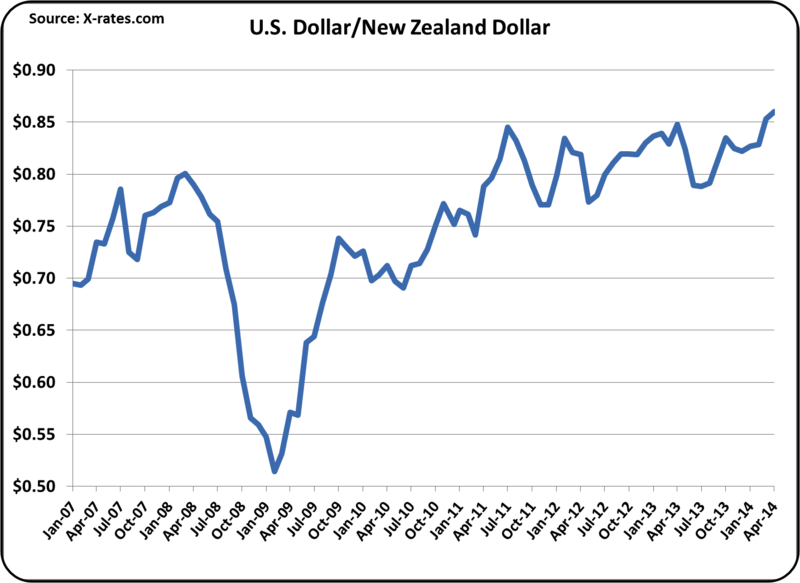 The wide fluctuations in USD exchange rates vs. New Zealand were largely responsible for the 2008/2009 swings in U.S. dairy exports and the resulting swings in U.S. dairy milk pricing. Since then, the exchange rates have settled down and have been showing a trend toward a weaker USD and stronger NZD. The exchange rates are currently favorable for U.S. dairy exports. This will continue to be followed in future posts to this blog. Exports are playing a major role in U.S. dairy markets and they will probably continue to grow in overall importance. More details on the U.S. dairy export trends can be reviewed in the 2013 review of the international dairy markets. Future developments will be reviewed in future posts to this blog. March 2014 Class and Components were announced on April 2. Most prices were new all time records. Class III milk remained near record highs (Class III was $23.33/cwt. vs. a record of $23.35/cwt.) and the other milk classes all reached new record highs. 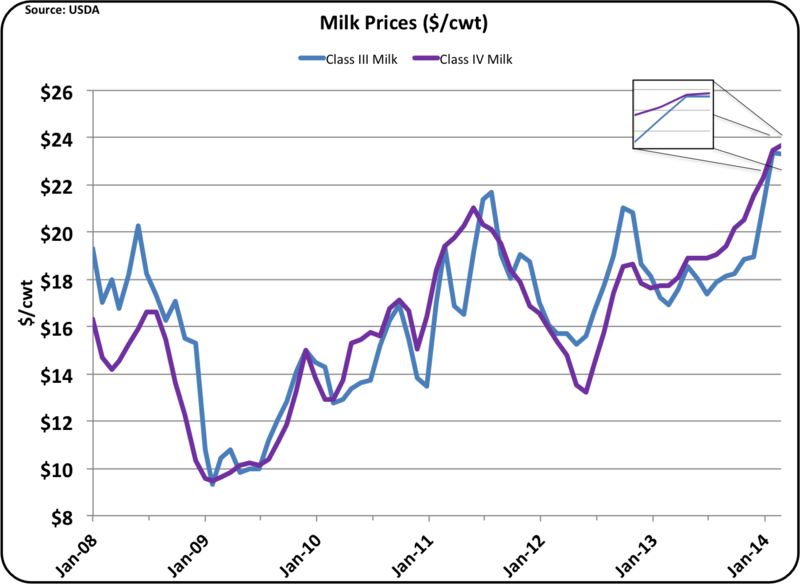 The most important record setter was Class IV milk at $23.66/cwt., driven by the record price of NDM at $2.09/lb. Because the Class II is based on Class IV plus a premium, Class II milk also set a record at $24.22/cwt. Class I is paid on the advanced system and is currently a record high for April of $23.65/cwt. The Class IV record price kept the Class IV above the Class III price, which makes Class IV the basis for the Class I milk paid on the advanced system. See the February 25, 2014 post to this blog for an explanation. Protein was down slightly and butterfat and other solids were both up slightly. These component prices offset to keep the Class III price almost constant. Protein at $4.52/lb. 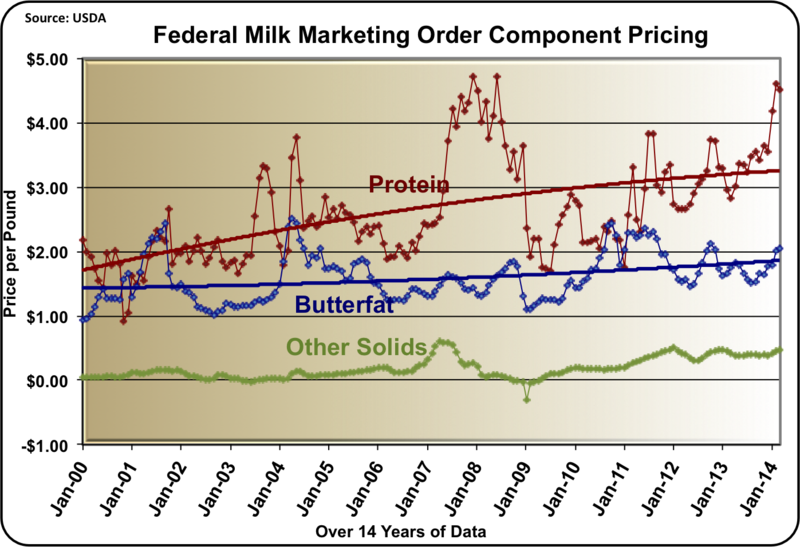 was well above it's trend line, while butterfat at $2.05/lb., and other solids at $.47/'lb. were just slightly above their trend lines. Milk protein is growing in importance as new products and consumption trends emphasize protein over fat. The composition of the Class III price remained nearly identical to the prior month with milk protein contributing 58% of the revenue. Milk protein is obviously the most important component for producers to emphasize. Inventories of the key commodities driving milk pricing remained low at the end of February. March inventories are not available, so the data below are really the drivers of February pricing. Lower inventories drive higher prices. 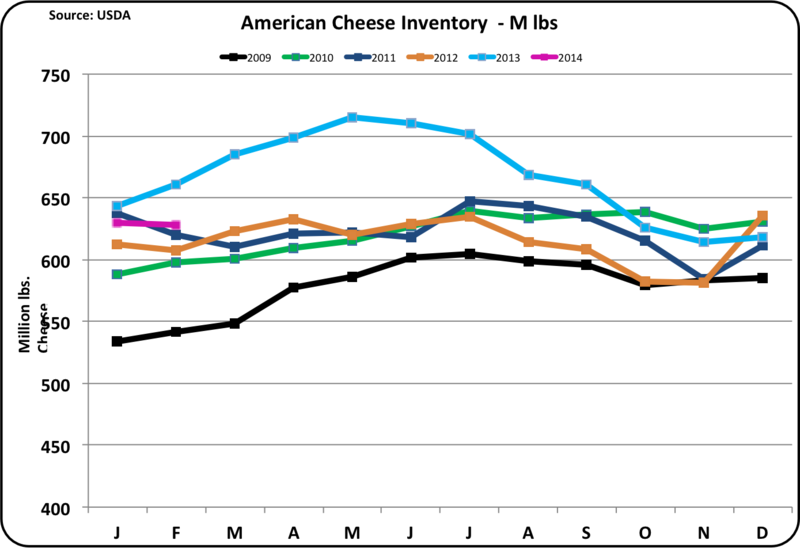 Cheese inventories were lower than the prior month at the end of February. Typically, they increase in February. 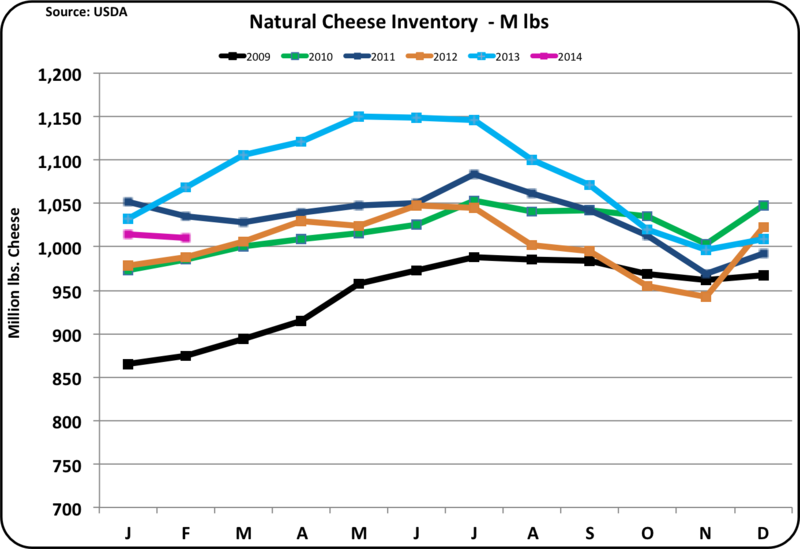 While the low cheese inventories were primarily driven by strong cheese exports, the relatively low cheese production also contributed to the lower inventories. 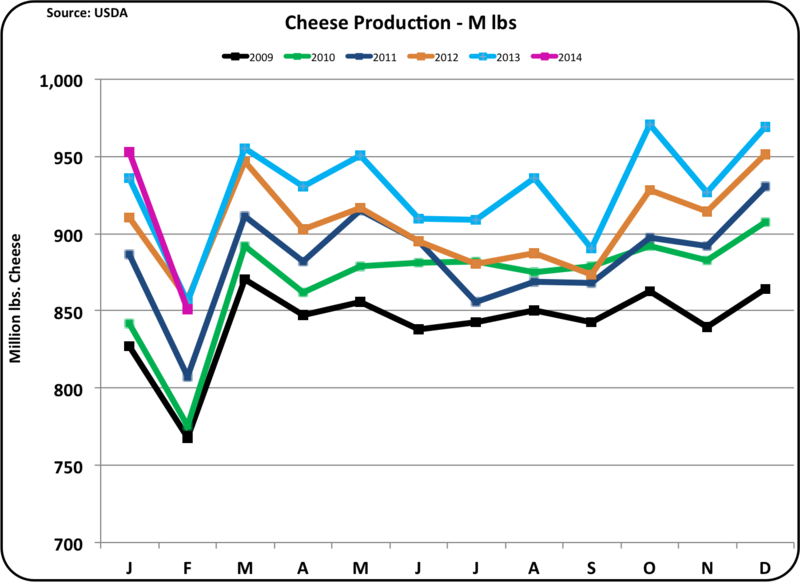 February is a short month and therefore is typically the lowest production month of the year, but February 2014 was especially low. 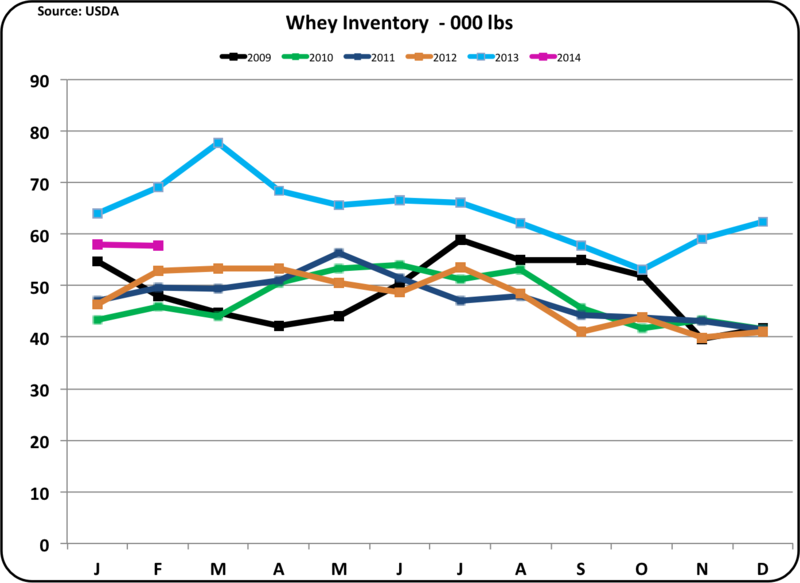 Dry whey inventories were well below the prior year levels keeping dry whey prices high. The price of dry whey is the basis for other solids pricing. 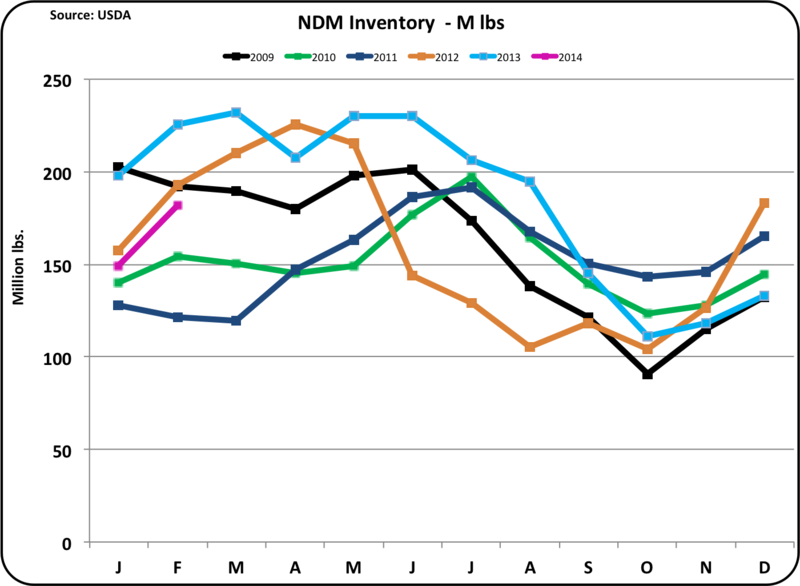 NDM inventories remain tight, driven by the high exports. 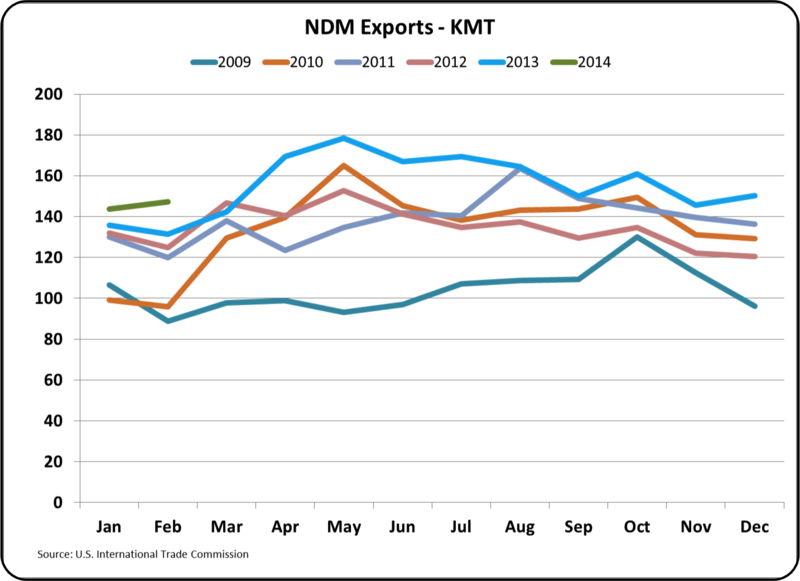 January export data indicated a softening in NDM exports, so the soon to be released February export data is very important. 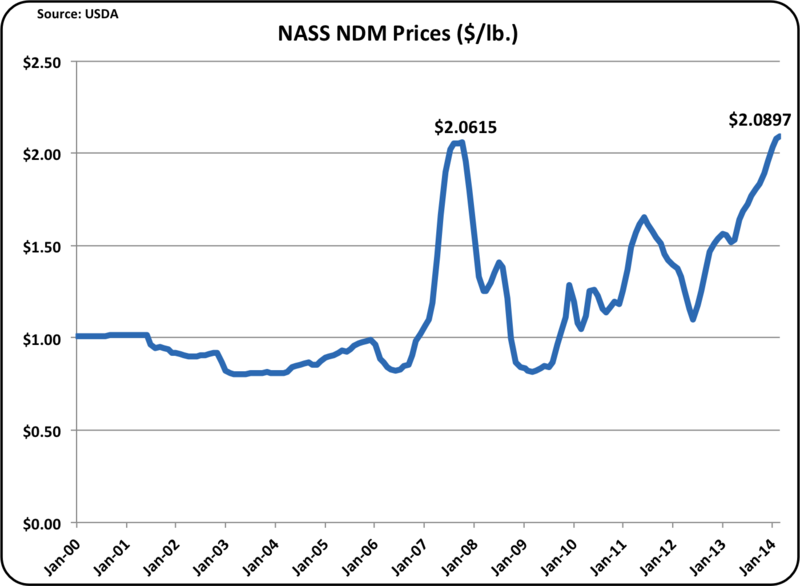 The price of NDM is the basis for the Class IV skim milk price and is a very important factor in the current high milk prices. The current futures price for Class III milk indicates a new record price will be set in April and Class IV will remain high, but drop a little. This should provide an excellent revenue base for U.S. Dairy producers. Exports are key to this and when export data is released it will be analyzed in the next post to this blog.